These two men are being sought by police after they went on a shopping spree with their victim's money after beating and robbing a delivery driver. Philadelphia police are seeking the public's assistance after two men beat and robbed the driver of a Chinese restaurant, then are caught on video laughing as they spend the victim's money. According to police, the assault occurred on Sept. 18 at about 12:39 a.m., in Old Kensington, after a 31-year-old man, an employee of Peking Garden Restaurant at 1322 N. Hancock St., stopped to make a delivery on the 1300 block of North Hancock Street. At that time, police say, the driver was waved down by an Hispanic male. When the complainant pulled over, police say the first suspect told the driver that he didn’t have any cash and called a second Hispanic male to come and pay for the food. Instead, according to law enforcement officials, the second man stepped closer, pulled a handgun and demanded money. After handing over an undetermined amount of cash, the armed suspect struck the driver in the head with the handgun and stole the driver's wallet, containing credit cards and identification, police said. Both suspects then fled on foot and were last seen headed toward the 1200 block of North Hancock Street, said police. 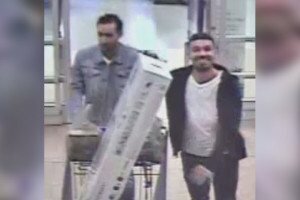 A short time later, however, the suspects were captured on surveillance video operating a dark-colored sedan, possibly a Honda Civic, using the complainant's credit card at a Sunoco gas station at Knights and Woodhaven Road at 2:17 a.m., and then at a Walmart inside the Franklin Mills Mall, police said. In video that police shared on Thursday from the businesses where the thieves spent their ill-gotten gains, the men can be seen laughing and celebrating after purchasing, what appears to be, a flat-screen television with the victim's credit card. Police are asking anyone who may have information in these crimes to call 911 immediately. If you'd like to submit a tip anonymously, you can contact police at (215) 686-8477 or text a tip to 773847.